Desafiando a Nomenklatura Científica: Se o design é ilusão, por que buscar design em uma aranha??? Se o design é ilusão, por que buscar design em uma aranha??? 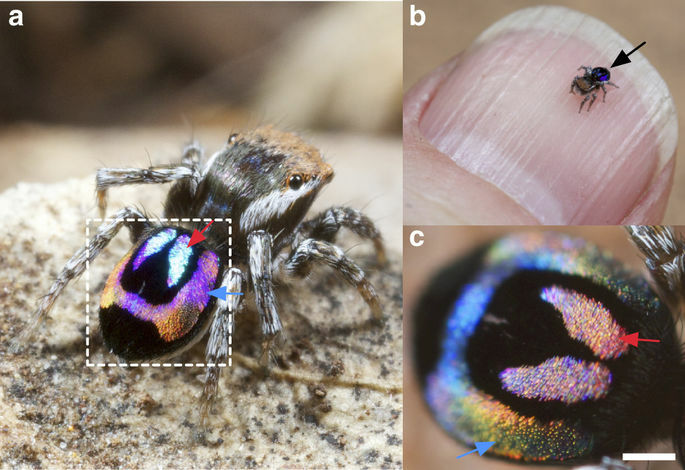 Colour produced by wavelength-dependent light scattering is a key component of visual communication in nature and acts particularly strongly in visual signalling by structurally-coloured animals during courtship. Two miniature peacock spiders (Maratus robinsoni and M. chrysomelas) court females using tiny structured scales (~ 40 × 10 μm2) that reflect the full visual spectrum. Using TEM and optical modelling, we show that the spiders’ scales have 2D nanogratings on microscale 3D convex surfaces with at least twice the resolving power of a conventional 2D diffraction grating of the same period. Whereas the long optical path lengths required for light-dispersive components to resolve individual wavelengths constrain current spectrometers to bulky sizes, our nano-3D printed prototypes demonstrate that the design principle of the peacock spiders’ scales could inspire novel, miniature light-dispersive components. We thank David Hill for commenting on the manuscript and Nathan Morehouse for the peacock spider vision discussion before submission. This research was funded by the National Science Foundation (IOS-1257809, T.A.B. ), Air Force Office of Scientific Research (FA9550-16-1-0331, M.D.S. ; FA9550-15-1-0068, D.G.S. ; FA9550-10-1-0555, D.D.D. ), Human Frontier Science Program (RGY-0083, M.D.S. ), Fonds Wetenschappelijk Onderzoek (G007177N, M.D.S. ), The Scripps Institution of Oceanography Biomimicry for Emerging Science and Technology Initiative (D.D.D.) and The University of Akron Biomimicry Research and Innovation Center (B.-K.H.). B.-K.H. is supported by The Sherwin-Williams Company under a Biomimicry Fellowship. T.A.B., M.D.S., and B.-K.H. conceived research, and wrote the initial manuscript. B.-K.H. designed experiments, performed microscopy, and analysed data. R.H.S. performed optical modelling, simulations, and analysed data. D.G.S. performed imaging scatterometry. J.C.O. collected and documented spiders. M.C.A. and D.D.D. performed hyperspectral Imaging. Y.L. and Y.-F.L. performed two-photon nanolithography and prototype characterization. T.A.B. and M.D.S. provided scientific leadership to B.-K.H. All authors discussed the results and commented on the manuscript at all stages.